On April 21, Yasufumi and Hijiri Koyama held a double-ring ceremony wearing ryuso at the cultural property Furusato En, in Okinawa City. After the ceremony, they moved to Nakagusuku Castle where the wedding party was welcomed by the eisa dancing of Nakagukusu Gosamaru Daiko. They took a commemorative photograph afterwards. 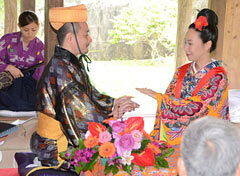 The wedding was organized by the Uruma Real Wedding Committee and tourism officials, and the cultural association of the Nakagusuku Municipal Office and the administrative office of Nakagusuku Castle also cooperated in the running of the event.